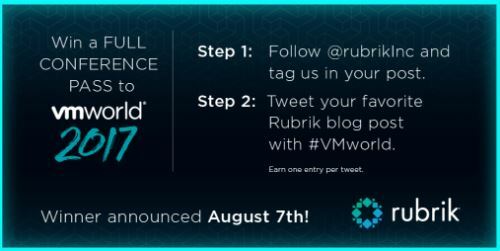 Full list to win a free ticket / conference pass for VMworld 2017! VMworld US will take place in Las Vegas, August 27-31 and VMworld Europe is September, 11-14 in Barcelona. As not every company can or will afford to send their employees to a conference, you can try your luck and win a free ticket. Check back to this site regularly to stay up to date and not to miss a chance! I will maintain the list and add every new raffle I am aware of. Veeam raffles a full conference pass to a lucky winner each week from 22nd of May to 4th of August 2017 for either VMworld US or Europe. So you have 10 chances for a free ticket – take your chance NOW and register! Earn one entry per tweet! Read Jorges blog post about this contest where you can win a VMworld Pass! Datrium – Want a free pass to VMworld Las Vegas? Tegile raffles one full conference pass for VMworld US on July 19. Register soon to get your ticket. Check back regularly to take every chance. If you know about a raffle you miss here – tell me! You can use the comments or you write me at Twitter @lessi001. Pingback: VMworld 2017 - Should I stay or should I go? Here some pro and cons!